I was struck by the milky white glaze on the most stylish of pitchers. That is the first piece of brilliance I saw when I came across Farmhouse Pottery. 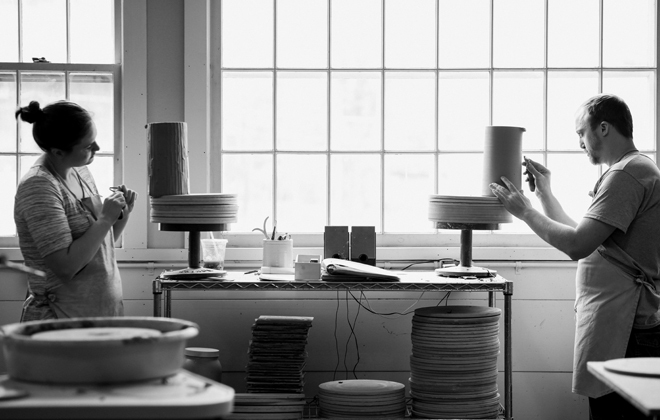 Visionary founders and partners Zoe and James Zilian were combining sturdy utilitarian ceramics with a chic minimal design. 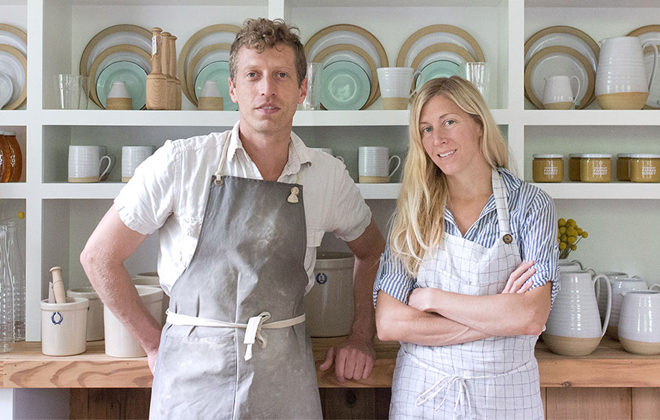 Based in Woodstock, VT, the couple opened their storefront and workshop in 2012, and it has since turned into to a full-blown lifestyle brand, but one that is still totally and completely rooted in the same ethos of those first ceramics – utilitarian, but beautiful, taking cues from American pastoral living, and made for farm-to-table eating. (L) Setting a chic table. (R) Bakeware never looked so good. 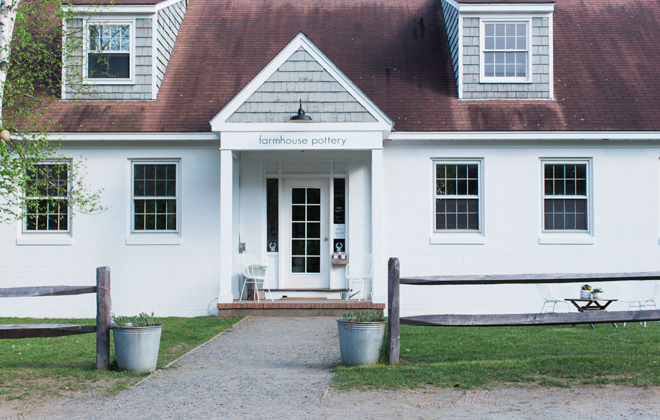 All photos from Farmhouse Pottery. The idea came from a love and commitment to local food, one that didn’t just see ‘farm-to-table’ as a trend, but as a way of life for sustainable communities. 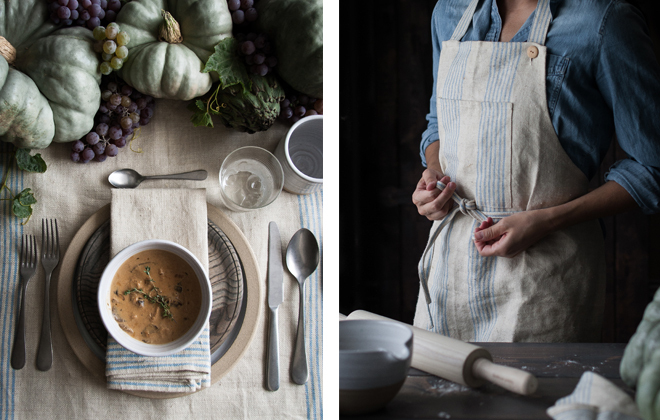 They wanted to create local ceramics to serve up all this amazing local food. Each having background’s in design and ceramics, they decided to start making pieces to sell at local farmer’s markets. The idea caught on fast, and soon they were able to grow the business from a weekend hobby, to a full-blown workshop and storefront. What’s also so unique about the Farmhouse operation is that their workshop is completely open to the public. Housed in the old Lewis Bible Bindery, anyone can stop by and see how these handmade pieces come to fruition. “People don’t understand how hands-on pottery is unless they watch it,” James says, “that’s why it was important to us to have this workshop for people to actually experience it.” Here, the Farmhouse Potters mix their own special recipe of clay mined from the midwest, and hand-throw each pot on an American made wheel. And anyone can come and watch! How fabulous is that? I love the simplistic elegance of the exterior as well. Zoe and James standing proudly in front of their wares. They make a great team! 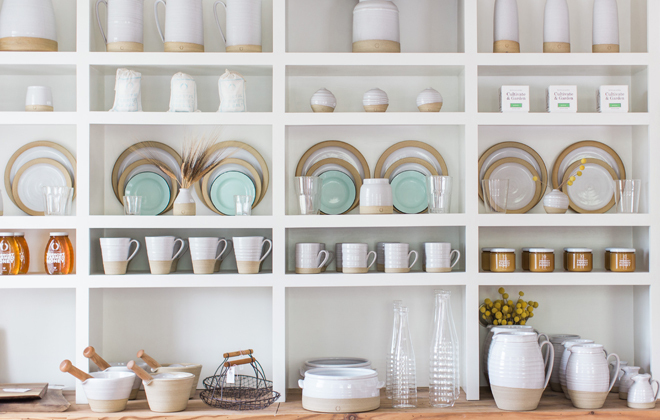 What started as a small “mom and pop” operation has since turned into a full blown lifestyle company, selling not just pottery, but furniture, homewares, and even locally produced honey and jams – all designed by the Zilians and made locally. What’s great to see is that even with the growth of the business, they still treat everything the same way, having their hands in every aspect from design to production, to marketing and sales. Handcrafted with love, through and through.